In my last post I mentioned that I had some exciting news. . .If you are a friend of mine on Facebook, Instagram, Flickr, Twitter, or Tumblr; you may have already heard it or figured it out from some of these visual hints over the past few days. I spilled the beans earlier on those social sites and it's time to let you blog followers know too. (You get all the good pictures!) 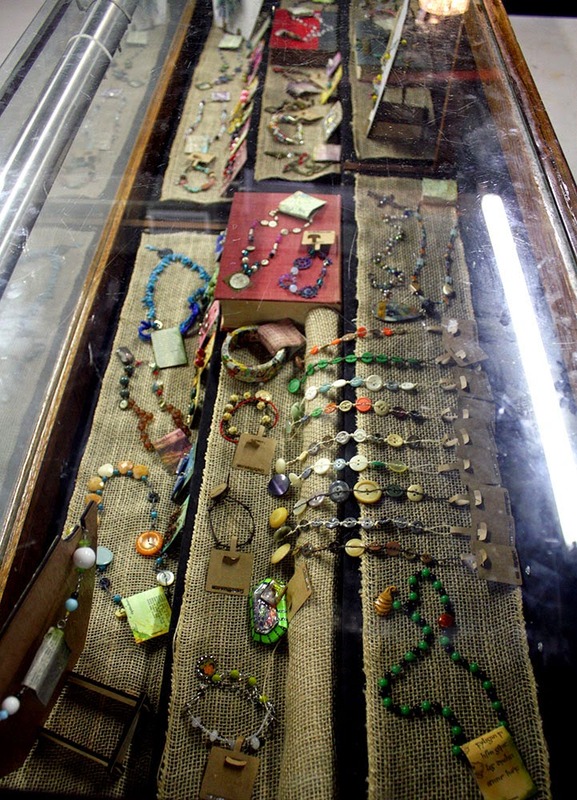 Here's the skinny - I got a display case at a new store; Southern Antiques and Accents, an antique mall here in Fairhope!! 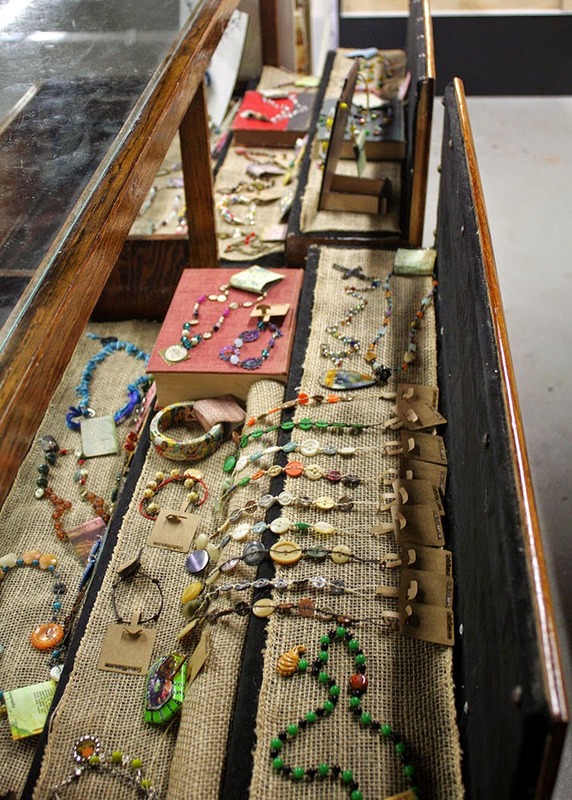 The booths contain an array of goodies from antique pieces to upcycled creations to mixed media art and more. I was fortunate to snag a display. I've been working like a madwoman the last few days pricing my available jewelry pieces and coming up with how to display them. It's been a fun, exciting kind of mania. This was how my case looked when I went in there this morning. All empty and sad. And, here's how it looks done. (I used the panoramic function on my phone's camera so it gives the case a little fisheye look. Sorry about that.) I'm not too sure about all the blank black space along the back, but I still need to make a sign and Pat's going to make me a few more of the necklace busts. So, that should cover it. Here's a better look at the left side from straight on, though you have to squat to see it like this. This is the same side from above. I threw some books in just to add some height and give some visual interest. This is the middle of the case. I need to fiddle with the burlap ribbon a little to make it more even, but it'll do for now. The right side of the case almost straight on. The right side of the case from above. I wrapped a small mailing tube in some of the burlap so the button bracelets wouldn't just hang over the edge. 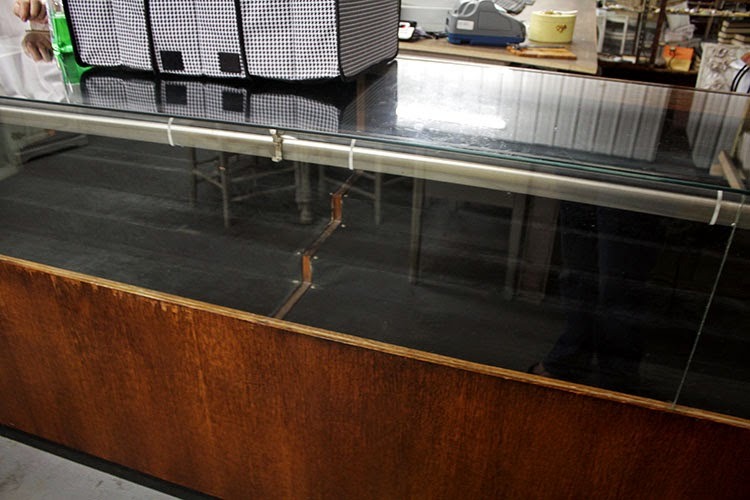 For access to the jewelry, the drawers pull out. I'm just so very excited about this new venture! 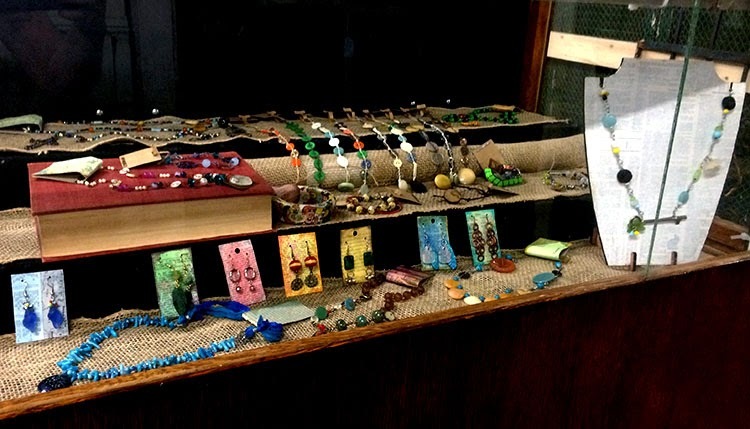 Let me admit that this is the very first time I've displayed my jewelry. I've never done a craft fair or been in a shop or anything like that, so this is an adventure. . . a very exciting venture that I've been building up to for years and years. I know there's a lot more that could be done to the display, but for limited time, budget, and knowledge - I'm quite happy with it and just had to share it with you. Have you ever displayed in a booth like this? Did it take you 5 years to work up the nerve to do it too? Congrats on the case...it looks GREAT!!! I will be sure to drop by the next time that I am on that side of the bay. Hope, it's very creative and just beautiful. You did a great job with the "visual merchandising" part of it! I'm loving that burlap covered mailing tube...You are going to do great, so make more jewelry!!! Judy, Oh, THANK YOU! The mailing tube was the most last-minute decision I made. Seriously, just a few minutes before walking out the door to set it up I decided I might need something curved in the case so I grabbed a couple of tubes (including a paper towel roll) and some tape. I've already started on the 'more jewelry' and am so exited that I have another outlet for it! Your display looks awesome and totally your style, Hope! I can't answer that last question as I've been making jewelry less than 3 years ;) But I am super pleased for you taking this step. Congrats! Congratulations! I think your display looks really eye-catching and pretty. I'm so excited and happy for you! You will be a huge success, and I'm going to visit this store and tell them the reason I came in was because of you! Congratulations Hope, this is great and your display looks perfect! I'm so excited for you! This is a great new experience and I wish it's rewarding :) I checked out the link and it looks like the surroundings are just right for your creations! Wow! It looks terrific! I'm so excited for you. Hubby and I have been to that place twice. Once we were too early and once it was a Monday, so both times they were closed. We will try again when we're in town. I hope you do well and I hope the mall in general is successful too. Good luck! Congratulations, Hope! It looks great and I wish you much success with your new venture. oh wow! CONGRATULATIONS HOPE! this is so very exciting! 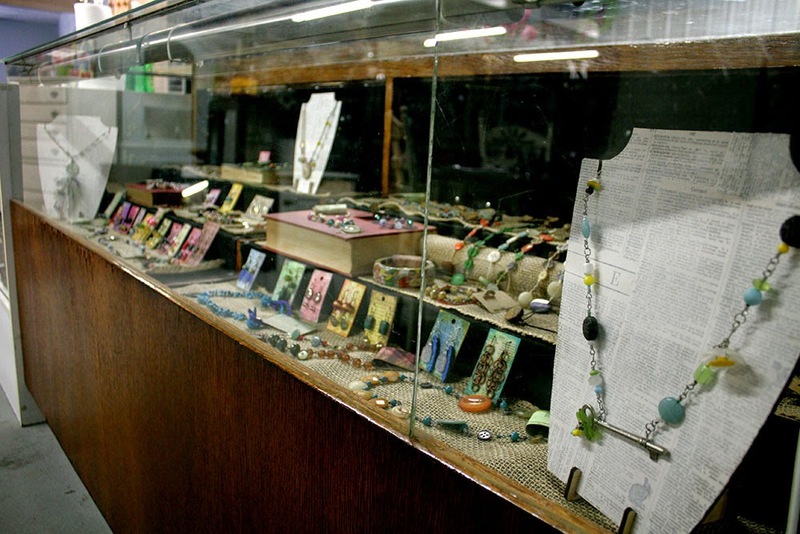 I have all my jewelry crammed in various boxes .... it would be so much fun to spread it out and display it this way. Wishing you much success in your new adventure! Doesn't look like a first timer to me! Looks great Hope. Good luck to you in this new venture! Art shows are fun - meeting those that love your work is great feedback and gives you a high. I mean TammIE. . .GAH, I know how to spell your name. . .I'm just rushing. So sorry!! This is So Exciting, Hope!!! All the best to you ~ may you get many sales, constant traffic and the recognition you deserve! 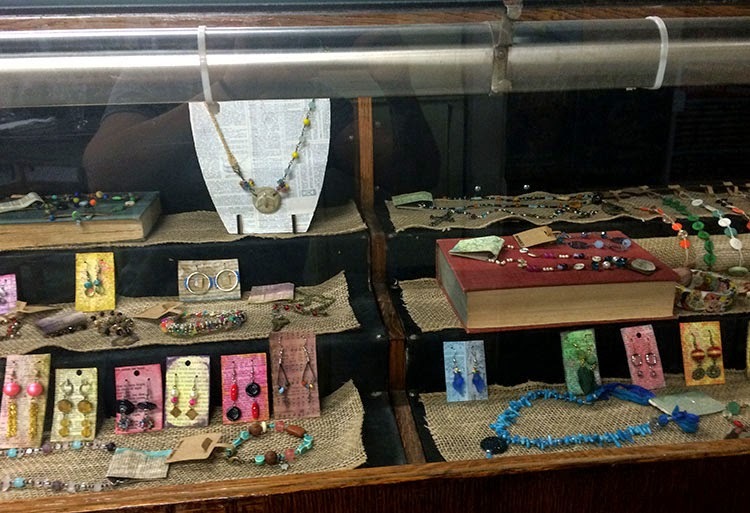 I love how you took this plain old case and gave it interest with the burlap and books and those fantastic necklace displays! Those button bracelets stand out beautifully! How exciting! I've never tried to sell anything at a craft show, but I love to attend them. Lisa, I do hope this works out, it's a 3 month commitment. Added bonus. . .I get to go peruse the other booths any time I go tidy up mine! Thanks so much for popping by! Congrats on your new opportunity Hope! 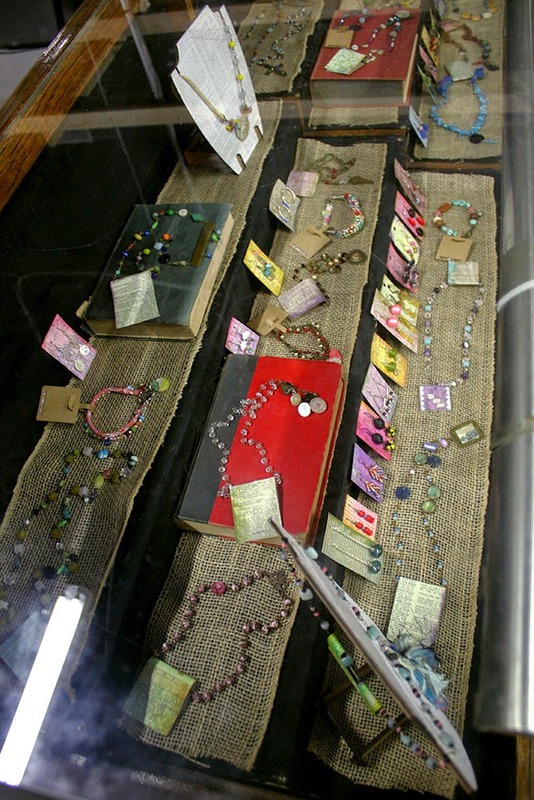 I have been selling in an art & craft gallery for several years and I am always tweaking my display. It needs to be "freshened up" often. Your display is terrific! 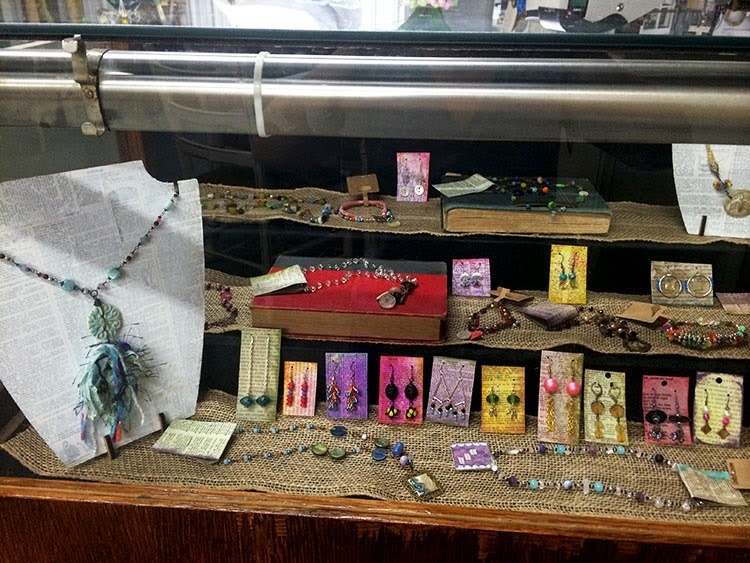 I love the burlap and books, your clever jewelry tags, the colorful earring cards. Your easels are also clever and beautiful. Your jewelry looks great! I also love that the display is in drawers. How nice that everything is easily accessible. You mentioned not being sure about the black background. You could try covering it with burlap (maybe in colors), or linen, or cheesecloth. Good luck Hope!! Wow Hope!! Big congratulations to you!!!! Your display looks fantastic, and I wish you much success with selling there. It looks wonderful! What a great space and I love how the display slides out.